Noah was born in Switzerland, growing up mostly near Austin, Texas, USA and subsequently in England. Having started welding sculpture at 11 years old and leaving a somewhat unsuccessful schooling experience behind, it seemed natural to progress to a Foundation Art course and a Degree in Fine Art Sculpture. This was later augmented by a year’s training in Blacksmithing at Hereford. Various occupations have also included being a motorcycle courier in London, shop design and fitting in Wiesbaden, Germany and working near Harare in Zimbabwe to build a prototype mini-hydroelectric turbine. Noah is Currently “Art Cluster Resource Development Manager” for Plymouth College of Art. Noah gained his degree in Sculpture (B.A. Hons, First Class) from Ravensbourne College of Art and Design. Formal training in Blacksmithing as a vocational subject at Hereford College of Art and Technology. Metal-work consultant for other artists including Danny Lane. Qualified teacher (PGCE and City &Guilds Adult Ed. Cert). Subsequently a Sessional Lecturer in Art History and 3D at Cornwall College, Saltash. 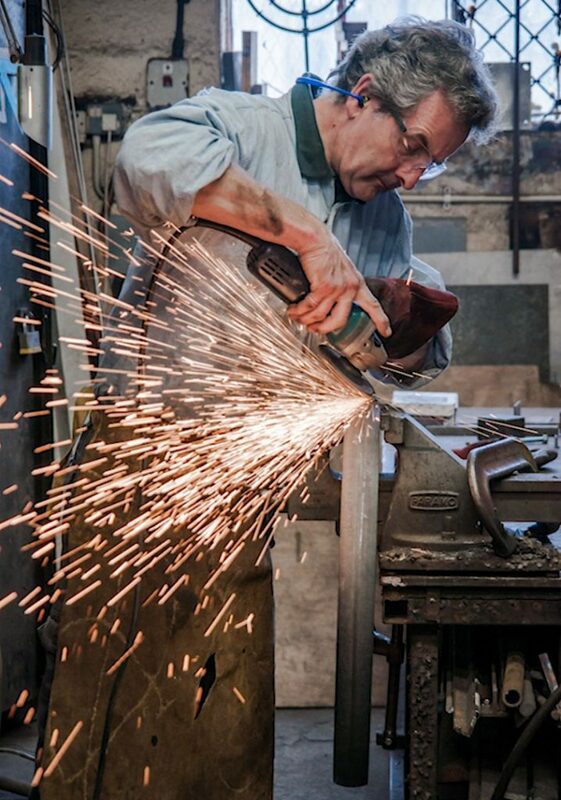 Founder Member and Former Director of Flameworks Creative Arts Facility in Plymouth, U.K.
Noah has also continuously worked independently as an artist, sculptor and designer-maker working on his own projects and commissions. Seats and Benches – Hatherleigh, West Devon Borough Council; Family Seats – Cycle Network, Tavistock Devon; Big Blue Wave Bench – Mountbatten Centre, Plymouth; Public Seating – Falmouth Moor Regeneration; Public Seating – Moretonhampstead Development Trust; Parkland Seating and Tables – Bovey Castle Hotel, Dartmoor; Memorial benches - Hooe School, Plymstock, Devon. Barbican Theatre Sign - Plymouth; Greenlink Signage - Devonport, Plymouth; Venus Company Signage, lighting and gateway – Newquay, Cornwall. Wind Giro - Ernesettle Community School; Dragon disabled access rampway – Exeter Arts Centre, EQUATA; Scott Business Park Entrance Gates and lighting – Plymouth City Council (PCC); Illuminated Gateway Columns – Gun Wharf, Plymouth, Devon and Cornwall Housing Association (DCHA); Cannon Gateway Feature – Gun Lane, Plymouth, DCHA. Art Furniture Warehouse – Camden, London; Starry Gazy – Mousehole, Cornwall; Tregeare House Estate Gates – Cornwall; Whitehawk Way Gates – Brighton, Chester and Diocesan Housing Association (CDHA); Sun and Moon Gates - Plymouth Hospitals NHS Trust. Bronze Plaques – Saltash Townbright Project; Bronze Plaques - Elburton School; Two Trees – summer school youth project, Plymouth; Saltmill Millennium Park - youth workshops; Fibonacci Spiral Green Wall – Plymouth Partnership For Progression (P4P); Desert Island Bench and Funky Fish – Creative Partnerships and Plymouth College of Further Education. Function Room Divider Screens - Plymouth Foyer; Community Artworks – Ernesettle for Plymouth Community Homes. Miscellaneous: Tree of Life – John Daniels Centre, Penzance, EQUATA; Cadeucus Finial – Isles of Scilly Health Centre; Moor Dragon cycle stand - Cycle Network, Dartmoor; Jungle Railings - (DCHA) Plymouth; Candleholders and fittings – Saltash Catholic Church; Archimedes Screw Ball-run – Plymouth Hospitals NHS Trust; Desert Island Sandpit – Plymouth Hospitals NHS Trust; Giant Octopus, Giant Starfish, Mermaids Grotto, Sea Floor Disco – Plymouth National Marine Aquarium.